"We're halfway through the last year of the century. Among advertisements for expensive ways to spend next New Year's Eve are articles trying to grapple with the millennium. What does it mean? What are we to make of this extraordinary numerical change in the calendar? Certainly it is a moment for reflection. It is a time to look back and forward. 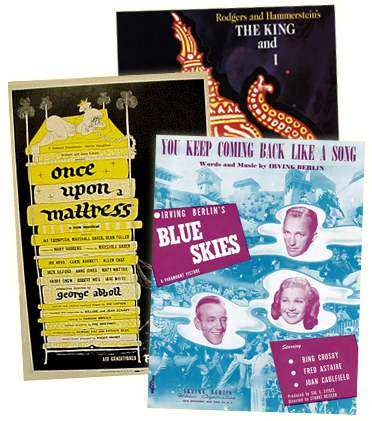 The Rodgers & Hammerstein Organization has a healthy respect for the past (we better have!) on which to base our thoughts about the future. What hasn't yet happened is a mystery; facing the year 2000 and beyond is made somewhat easier if we let the past show us the way to the future. Toward that end, I've been thinking about two events. First was the Broadway revival of ANNIE GET YOUR GUN. The original production foreshadowed the present-day Rodgers & Hammerstein Organization: it was the only time Richard Rodgers, Oscar Hammerstein II, and Irving Berlin worked together. What made the producers Rodgers & Hammerstein turn to Irving Berlin after Jerome Kern, the original composer for the project, died? With a draft of a first act including titles like ""You Can't Get A Feller With A Gun"" and ""They Tell Me It's Wonderful,"" how could they as songwriters resist taking a crack at those song themselves? No, they were good producers first and foremost because they knew about writing, and they knew that Irving Berlin was the better composer for the show. Fast forward to Broadway 1999. Now one organization looks after the work of all three men. What decisions would any of them have made in response to the need expressed by the new producers to revise ANNIE GET YOUR GUN? We'll never know - we had only history and our instinct to guide us. The show has always been accused of being old fashioned - Berlin acknowledged that in the 1940's by responding, ""Sure, an old fashioned hit!"" And it is the same today. Surely at the show's core are themes that Berlin, Hammerstein and Rodgers believed in thoroughly, ones that will never age. So whatever the fleeting concerns of political correctness may be, if people aren't willing to get lost in each other's arms, we will all be in trouble in the next Century. The second event was the 50th anniversary of SOUTH PACIFIC. Elsewhere in this issue is a description of the action-packed, three-day celebration with surviving members of the original cast, but the moment that got to me took place at Symphony Space. Pulling together an evening of stories and reminiscences, we decided to add singers from today's Broadway to remind everyone of the power of the music and lyrics. Liz Callaway and George Hearn made the audience think, ""Why don't they play those parts?"" as they sang selected Nellie and Emile songs. The stories from the cast members were charming and educational. But when, late in the proceedings, the rising young Australian singer/actor David Campbell sang ""Younger Than Springtime,"" a moment happened that took us all by surprise. I was one of the hosts of the evening, and Betta St. John, the original Liat, was seated next to me. She was one of the five alumni chosen to lead the discussion and was the softest spoken of the group. When David began: ""I touch your hand and my arm grows strong,"" she started to cry. I saw her try to keep the moment to herself. I thought about this beautiful song, now a classic, which was first sung to this beautiful woman and is about a character she created. Slowly, everyone in the theater became aware of what was happening. There we were, very much in the present, thinking about 50 years ago, and listening to a new talent that will keep SOUTH PACIFIC and others of its ilk alive well into the next century. It seemed like a perfect Millennial moment.